Our goal is too big. Our board doesn’t do anything. Do these phrases regularly show up in your organization? What if by simply changing the words you could change the outcome? Online Giving: Are You Measuring these 3 Key Performance Indicators? 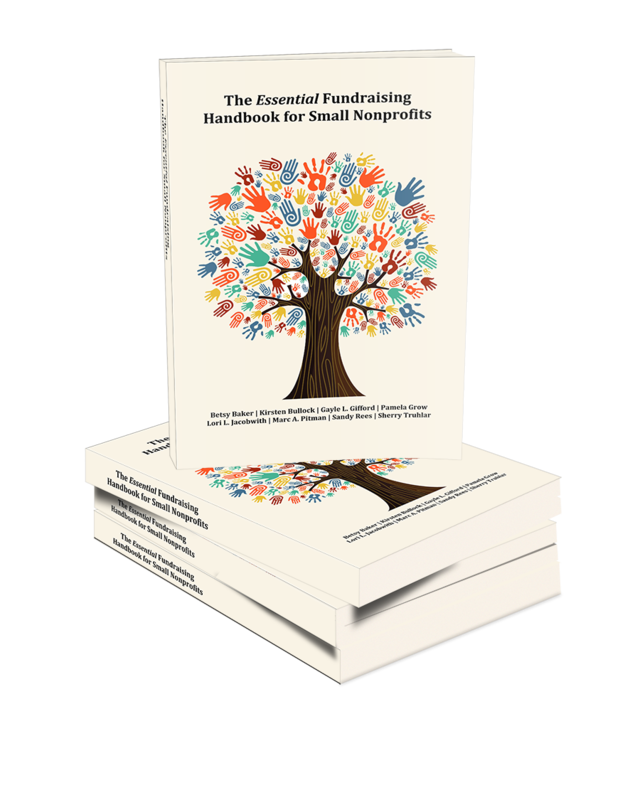 One of the hottest topics in fundraising is how to leverage online fundraising to raise more money at your nonprofit. Thank you to Dan Gillett from Kimbia for this week’s guest post with some terrific information and three simple ways to impact your online donations. High donor attrition rates (58.5% per year, according to the 2012 Fundraising Effectiveness Survey Report) force nonprofits to constantly recruit new donors. Fundraising economics have made online channels (web, social, mobile) an important way, in their own right, to acquire and retain new donors across all demographic groups. So, most nonprofits are seeking ways to successfully access the new funds that are moving online each year – estimated to be $13M in 2013. You can’t make improvements if you don’t manage outcomes, and you can’t manage what you don’t measure. When managed correctly, even small incremental improvements in each Key Performance Indicator (KPI) can greatly impact the revenue received to support your mission. For example, the third column of the table below shows how a small improvement in the conversion rate (from 2% to 2.5%) increases revenue by 25%. Ready to get started? Step one is to establish a baseline by reviewing your performance on each indicator using basic web analytics. Step two is to compare your results to industry benchmarks. Don’t worry when you see the results. Most organizations find themselves behind in one or more of the indicators. From here you can start measuring your improvement. Web Traffic: This is the foundation of any online program – if no one sees your message, it doesn’t matter what it is. There are a number of basic list building strategies and a number of new channels of outreach available for increasing traffic. Often quality online traffic can be generated through offline means. For example, a coordinated radio or direct response TV campaign with a call-to-action that drives people online could produce a new source of interested prospects. Some of the up-stream sources of online traffic (email campaigns, display ads, social media posts) can be optimized to produce higher click-through rates that translate into more visits. Conversion Rate: Once you have successfully attracted potential donors to your site, it’s important to minimize the mental, emotional, and physical friction of the giving process to maximize your results. Often organizations try to provide too much information or ask too many questions of donors who just want to fund the organization’s mission. The key is regular A/B testing of your message and donation form, along with observing and responding to donor behavior. With the right tools, optimizing your results can be done in less than 10 minutes a day. Average Gift: Two fairly simple techniques help here 1) working to tie higher donation levels to a stronger mission message and 2) using A/B testing on your ask array (the schedule of giving amounts) to improve the average gift size. Unlike direct mail, online gives you the opportunity to continually refine each aspect of your campaign, including the messaging, ultimate value proposition presentation, ask messaging, and ask array. And again, there are inexpensive tools that can help to do this in less than 10 minutes a day. Significant growth in online giving can be achieved by focusing on these three simple metrics – traffic, conversion rate, and average gift. If you are highly motivated and excited about getting started, establish your baseline indicators and see what you can do on all three metrics this month. If you are like many overworked, underpaid dedicated nonprofit team members who cannot do it all right now, at least establish your baseline this month and pick one of three key indicators to improve right now. Over the next six months you will be surprised at how one small improvement each month will add up, and ultimately increase the funds available for your mission. About Dan Gillett: Dan has more than two decades of experience launching, managing, and advising businesses. As Kimbia’s CEO, he leads the development and execution of the company’s corporate strategy. Prior to founding Kimbia, Dan founded and headed a successful, professional advisory services business, served as Senior Vice President and CFO of an early-stage telecommunications company, and worked in various roles with Credit Suisse, PepsiCo and Price Waterhouse. Dan is a director of the Metro Board of the YMCA of Austin. He has an MBA from Harvard Business School and a B.B.A. in Accounting from Harding University. A question I get asked often is: “How do we keep our donors wanting to come back?” It’s a topic that just about everyone one of us who work as fundraisers worry about, contemplate, and struggle with every day. As I read and re-read Bush Fellow Teresa Peterson’s blog post: “From Super Leader to Sustainable Leader” I recalled the faces and actions of many nonprofit executive and development directors. Nonprofit Marketing Guide.Com recently released the 2013 Nonprofit Communications Trends Report, an invaluable resource you can download free. The report is based on a survey of 1435 nonprofits from thirty countries and asked people what their communication plans were for the year, what tools they planned on using, and much more. The results are fascinating to say the least, and I’d really encourage you to download a free copy of the 34-page report for yourself so you can see how other fundraisers and nonprofits are hoping to spend their year. 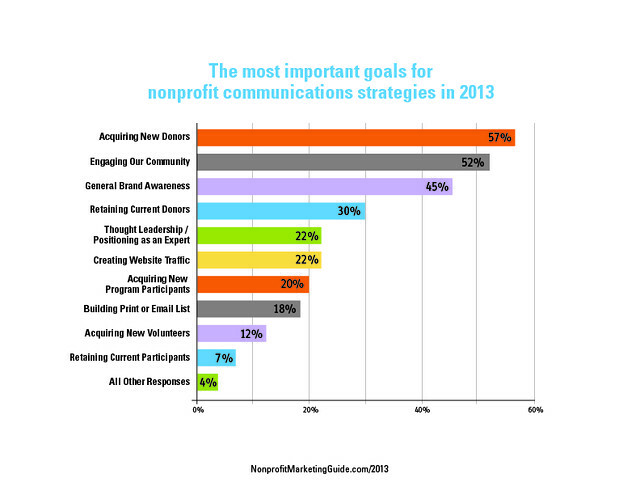 Not surprising was the graph and statistic showing how nonprofits identified their most important goals for the year when it came to their communication strategies. Acquiring new donors and engaging community were the top two vote getters. You can see the other priorities in the graph below. Behind these numbers is some juicy information about nonprofits and how bigger organizations prioritize their communications in comparison to smaller ones. From the report you’ll learn the differences between the Community/Brand Builders and the Fundraisers from their budgets to their plans to the tools they use to communicate. The “community/brand builders” were more likely to have written plans and to work for larger organizations (60% in this category have organizational budgets over $1 million). They were more likely to identify media relations/PR, blogging, and social media as very important tools. They were also more likely to say that phone calls/phone banks and paid advertising were their least important tools. They planned to email more frequently, and were much more likely to rely on and experiment with social media than “fundraising” communicators. Conversely, the “fundraising” communicators were much more likely to identify both print marketing and email marketing as very important communications tools, along with phone calls/phone banks and in- person events. They are likely to send direct mail more often, and to take a more conservative approach to social media. For example, they are more likely to say they are experimenting with sites like Twitter and YouTube, which have been more fully adopted by community/brand builders. What are you most excited you most about your communication plans for 2013? I’d love to hear what new things you are planning this year! It’s the week we celebrated and remembered Dr. Martin Luther King, Jr. and we also inaugurated our new (returning) President of the United States. I watch with an eagle eye how gently or how in your face the “ask” is made in emails and on websites. Want to be Productive? Relax. For many of us in the fundraising world, there are no longer any clear boundaries or “edges” to our work. We are doing more than a single job and the rate at which information comes at us is in hyperdrive.